Dan graduated in the top 10 percent of his class at West Point in May, 2003. Division, stationed in South Baghdad. In Iraq, Dan oversaw the building of schools and hospitals as a member of the Commander’s Emergency Response Team. Fluent in Arabic, Dan was involved in many issues of Iraqi governance and negotiations between Iraqi militants and U.S. commanders. He was the lead negotiator and interpreter during a water-crisis, addressing Baghdad’s Water Council in Arabic and receiving a standing ovation. Dan helped develop a new Iraqi education curriculum that included democratic virtues and trained the Iraqi police, all while continuing his education through online courses from Harvard University. After returning home, Dan came out as gay to his family and other close friends, eventually becoming more public with his sexuality. Shortly thereafter, Dan helped found Knights Out, an organization comprised of LGBT West Point graduates. His work as an advocate eventually led to an interview with Rachel Maddow on MSNBC’s The Rachel Maddow Show, where in 2009 Dan publicly came out as gay. Consequently, he received discharge papers from the Army and, after an unsuccessful appeal, was honorably discharged in 2010. The injustice of the “Don't Ask, Don’t Tell” policy prompted Dan to take a leading role in protests against the law. Dan soon became the face of the “Don’t Ask, Don’t Tell” repeal movement, and an LGBT rights activist. 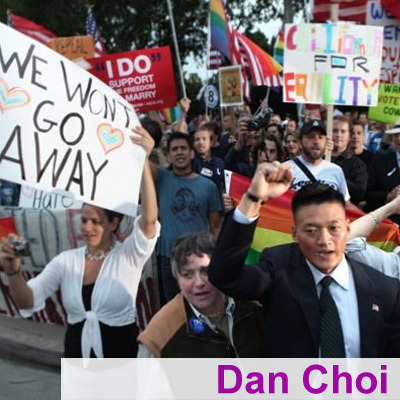 Dan organized and led marches and protests and engaged in a rigorous speaking tour, which included numerous television interviews and lectures at colleges throughout the nation in which he called for the immediate repeal of DADT. Once a court injunction was issued that effectively ended DADT, Dan immediately went to a recruiting station to reenlist in the Army.